I love recipes that are just two ingredients, like this one. I love dinner ideas that only take 30 minutes to get on the table, like this one. 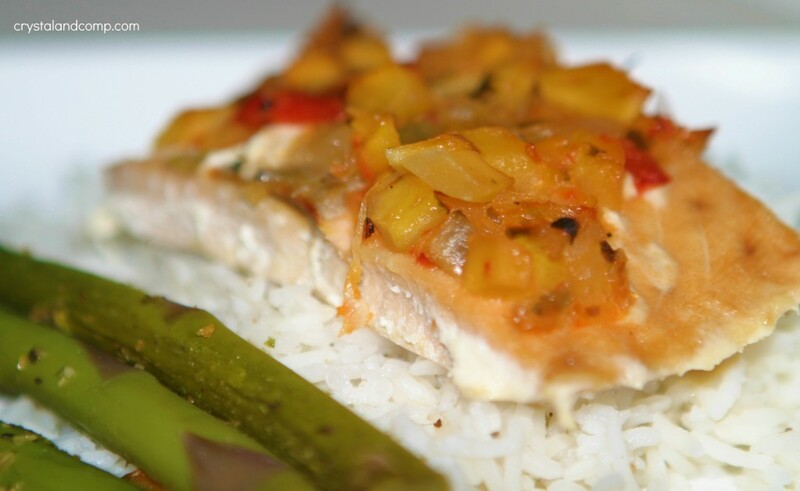 My kids love salmon recipes, like this one. 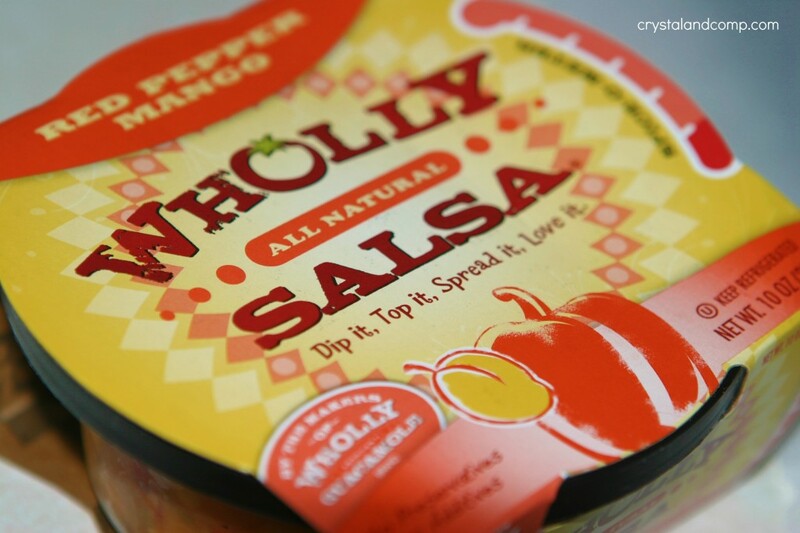 As you already know, earlier this week I met the great folks behind the brand Wholly Guacamole and they have a brand new line out called Wholly Salsa. Wholly Moley this stuff is good. (You knew that was coming, right?) You can check out the full Wholly Salsa line and enter my giveaway for 12 salsas and guacamoles. Place the salmon on a baking sheet. I like to cover the sheet with parchment paper to make for easier clean up. As you will also notice, I placed my salmon on the cookie sheet frozen. Shame, shame. Grab your Wholly Salsa Red Pepper Mango concoction. Scoop a couple spoonfuls of salsa over each fillet. 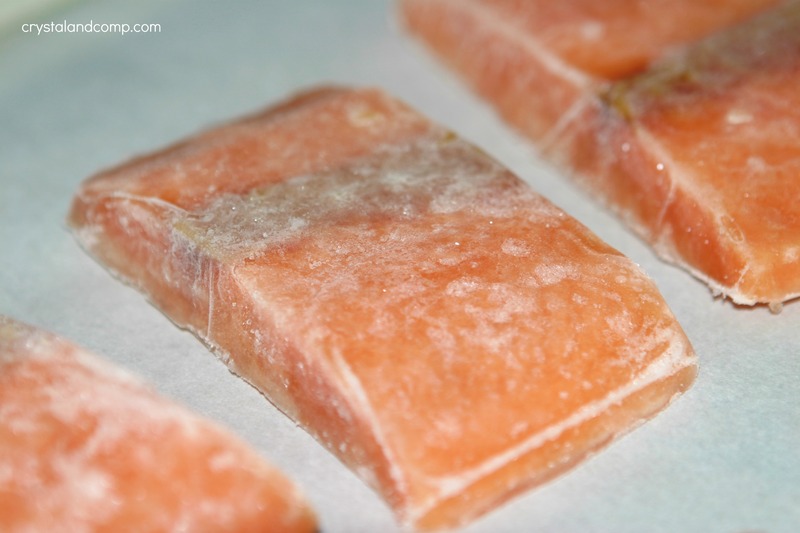 Pop it in a 350 degree oven for 15-25 minutes depending on how done you want it and depending on if the salmon is frozen or not when you place it in the oven. Super easy and very tasty. This did have a little spice to it, but my kids were cool with it. One of my boys thought it was too spicy (hello, he is Puerto Rican, nothing should be spicy to him) so we just scrapped the salsa off before plating his up. The spice level was very moderate to me. It mixed perfectly with the rice. Hi Crystal. I agree with you on that I love the recipes as simple as possible but also delicious. Thanks for such a beautiful recipe. I’ll try that. Thanks for such a beautiful recipe. I love mango on fish. Thanks for sharing this quick and healthy meal on foodie friday. 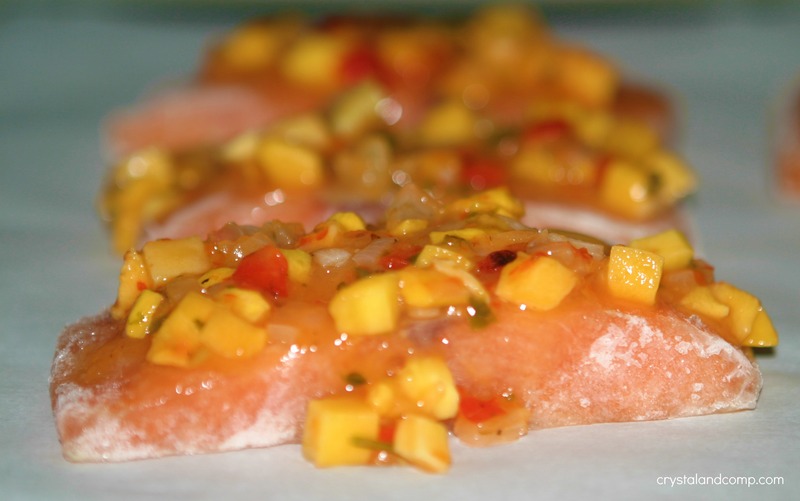 This is a great Salsa for the Salmon, it would be delicious! Hope you are having a great week end and thank you so much for sharing with Full Plate Thursday.